Shavuot commemorates the Torah being given to Moses on Mt. Sinai. The ten commandments contain some pretty weighty messages so first we modified them to a kid-friendly format. 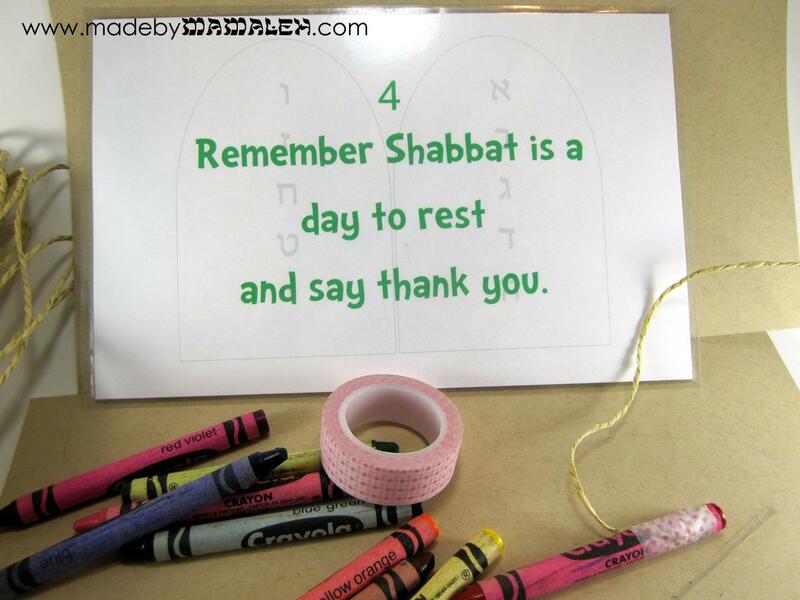 Another fabulous Jewish mamaleh over in Australia rewrote them beautifully and created a coloring sheet over on her Joyful Jewish blog so we used her lovely wording. I don’t know about you but my almost five-year really enjoys treasure hunts. 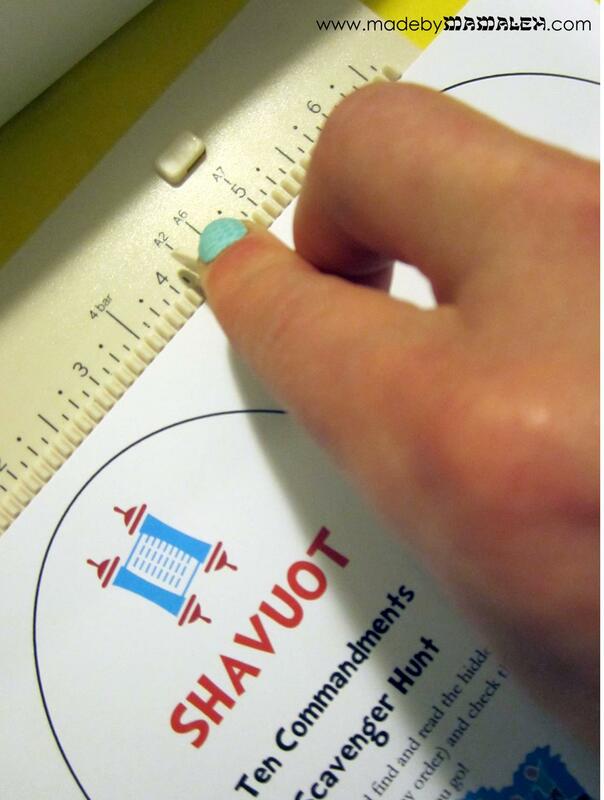 So what better way to make learning the ten commandments fun than with a Ten Commandments Scavenger hunt! (Or as my husband decided we should call it “J-caching” aka Jewish-geocaching.) 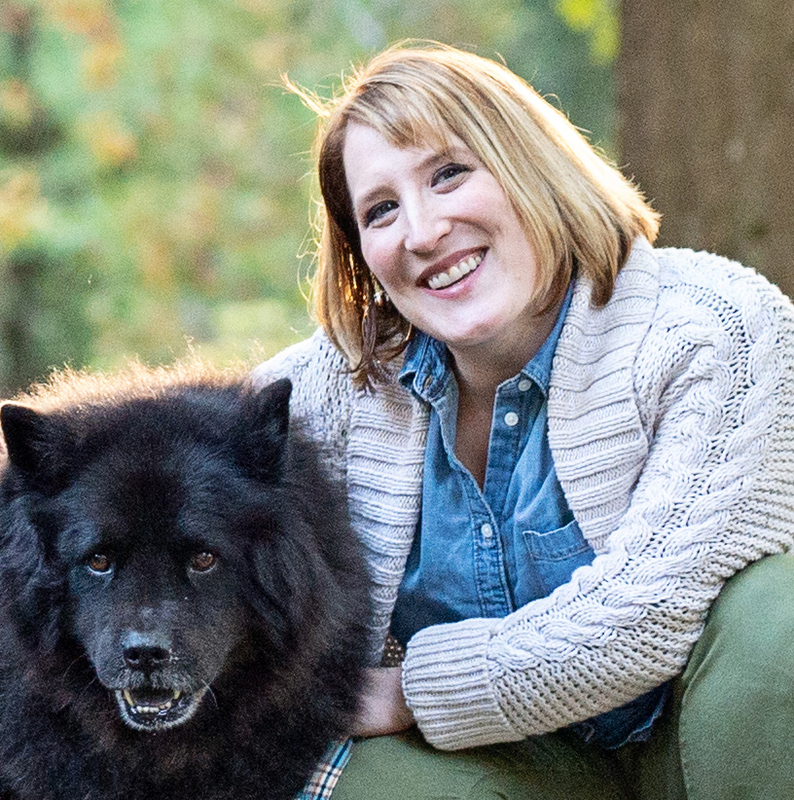 It was a big hit with everyone and now I am thrilled to share it with you. Since the commandments are both numerically and color-coded, even the youngest kids that can’t read yet can participate in the hunt. The scavenger hunt passports open right to left as any Hebrew text would and print two per page on the front and back of a piece of cardstock. Then they are simply cut in half (at 5 1/2 inches) and folded using my handy Martha Stewart mini scoring board for quick and easy folding – A2 is the center. 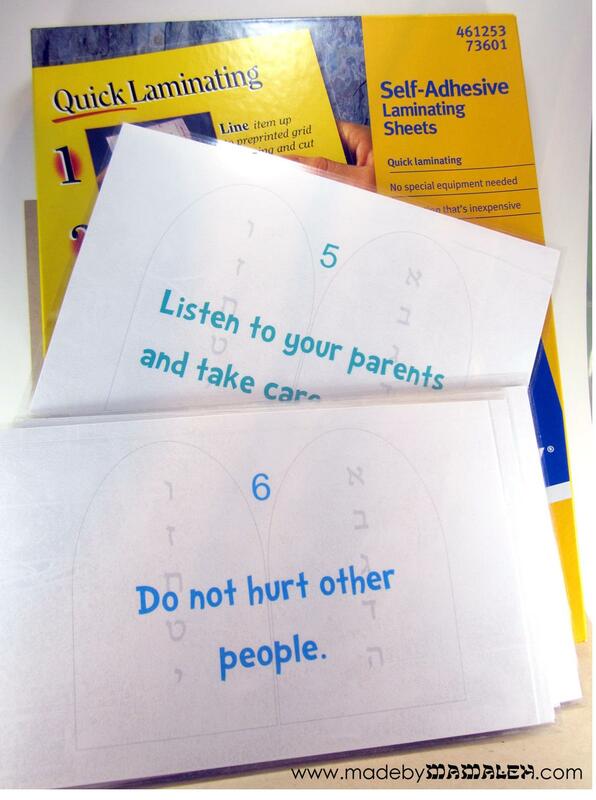 After the passports were done, I printed the commandment clues on cardstock as well. They are an 8 1/2×11 design but can easily be shrunk to print two per page as I did to make them a bit more manageable and difficult to find (you just need to change your PDF print settings – select “multiple”, 2 per sheet and landscape mode). Once the clues were cut to the right size, I decided to laminate them with self-adhesive laminating sheets so they can be used easily for years to come and stand up to any wear and tear from little hands. After they were laminated, I punched a hole to create a spot to tie a matching colored Crayon (secured to string with washi tape) to mark off the passports. This was helpful given that we had a large group doing this activity but if you want to use this at home, no need to get fancy. 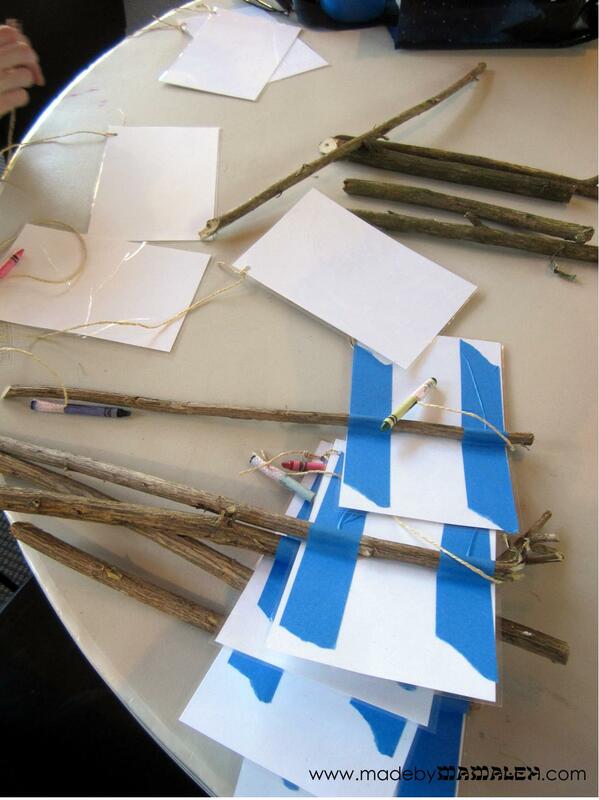 Finally, to make it easy to set these up around our synagogue playground, my husband recycled some sticks from our recent yard clean-up and used painter’s tape to attach the commandment clues. You could easily do this with dowels or stakes or skip it all together and just tape the clues up depending on where you are setting up. Sorry I don’t have any pics of how they looked set up, we were too busy having fun at that point! 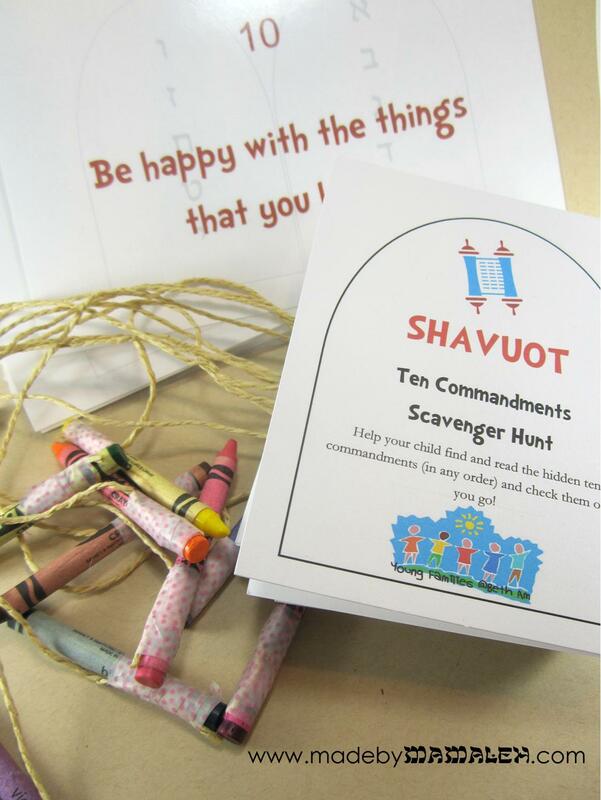 So if you are home today and could use a little Shavuot activity to keep your little ones busy, just click below to print these out for some backyard fun. 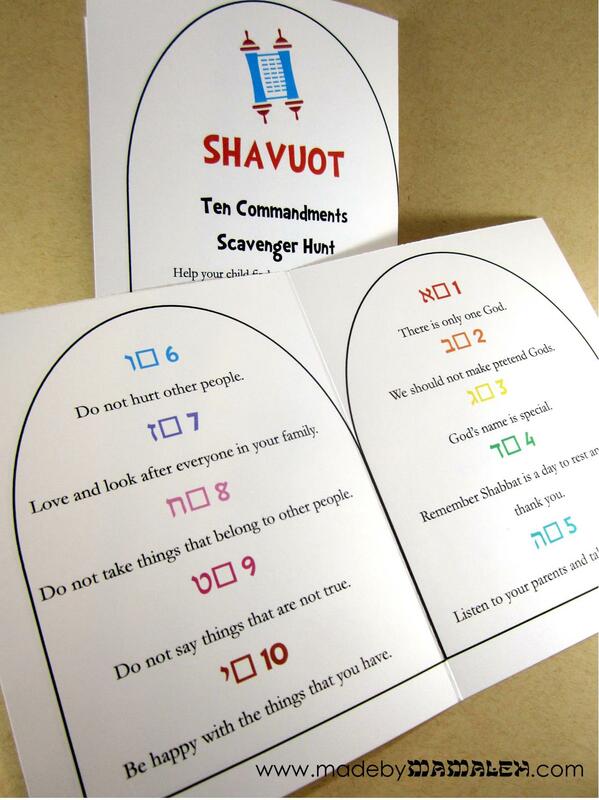 This entry was posted in Kids, Printables, Shavuot and tagged kids Shavuot, Printables, Shavuot. Bookmark the permalink. This is great! Did you just place them all around the yard? With multiple players you would just hide more than one of each scattered around? Yep, just placed around the yard with 10 stations. Pretty simple since for kids under 5.